I decided to try this chocolate pie recipe because it looked so simple. You do not have to temper the eggs, no complicated steps and multiple bowls to deal with. It is super quick, super easy and produces a super thick chocolate filling. It was a huge hit for the chocolate lovers at our house!! In medium saucepan, combine sugar, flour, cornstarch and salt. In a medium bowl, beat milk and egg yolks until smooth. Gradually stir the milk mixture into the saucepan that has the sugar mixture in it. Cook over medium heat (stir constantly) until the mixture comes to a full boil. Boil and stir for a minute or two or until it's very thick. Remove from heat and stir in the chocolate, butter and vanilla until the butter is melted. Pour into baked pie shell. Place plastic wrap directly onto the surface of the hot filling (this will prevent a skin from forming on the pudding). Chill overnight. 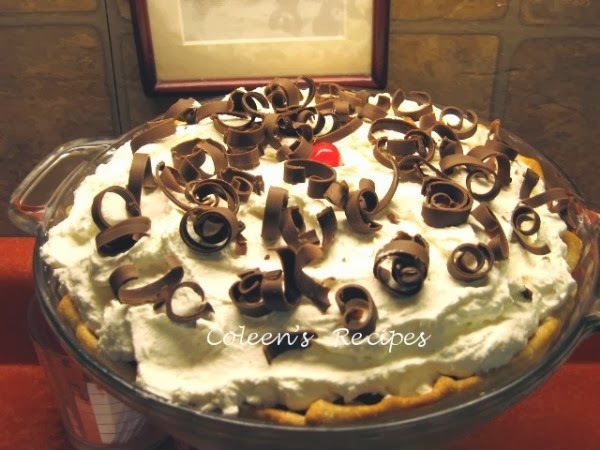 Top with whipped cream and chocolate curls. OMG!! !Can i take a slice or two?? Looks delicious Coleen. I like that it's fairly simple too!!! Finally, a fudgy pie that doesn't require raw eggs. This looks fabulous. Besides the crust, how does this one compare to the chocolate pie you posted a couple weeks ago? This looks so delicious. My kind of dessert! well hello!! that looks so great, yummy! My kids would enjoy making this. This recipe looks delicious! I really appreciate your blog--ever since you posted the recipe for honey whole wheat oatmeal pancakes they have been a staple in my house! 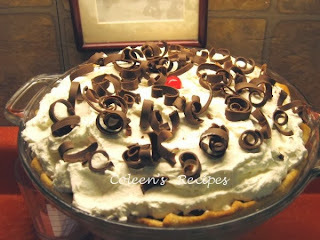 Coleen I just finished making this pie and couldn't find in your instructions when to add the chocolate!!! I added it at the end with the butter and vanilla. Seems to be okay. Is that when you added it also??? Yes, I'm sorry about that, you stir it into the hot liquid after it has cooked. Thanks Coleen...I'm glad I got it right!!! I get nervous with chocolate sometimes because I've had it seize on me. The pie is cooling in the fridge and we are having it tomorrow. I can't wait! Looks great to me! Would love some after dinner tonight! drooling!